I see pineapples, thousands of pineapples. They are totally tropical and seemingly everywhere I go lately. Everywhere! The pineapple (Ananas comosus) (สัปปะรด) is an indigenous plant from South America. Today the largest commercial producers of the fruit are Costa Rica with a whopping 2.7 million tons of production per year. 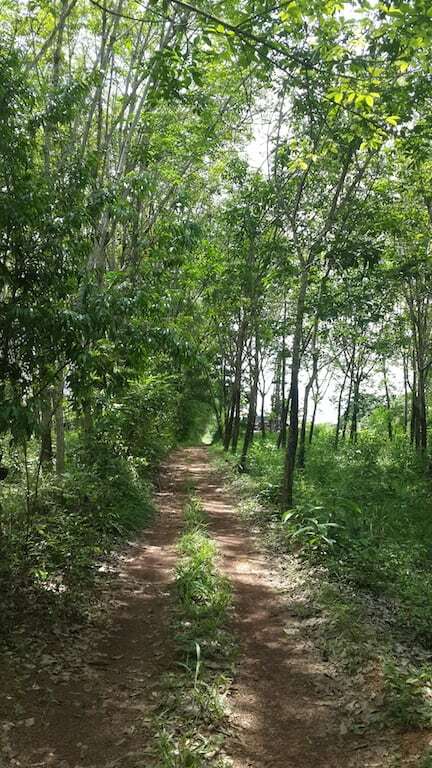 Thailand ranks 4th in the world with 2.2 million tons annual production and growing. Pineapples are a large sweet fruit that is actually made up of many individual berries that are fused together around a core. Each outer scale is an individual berry. 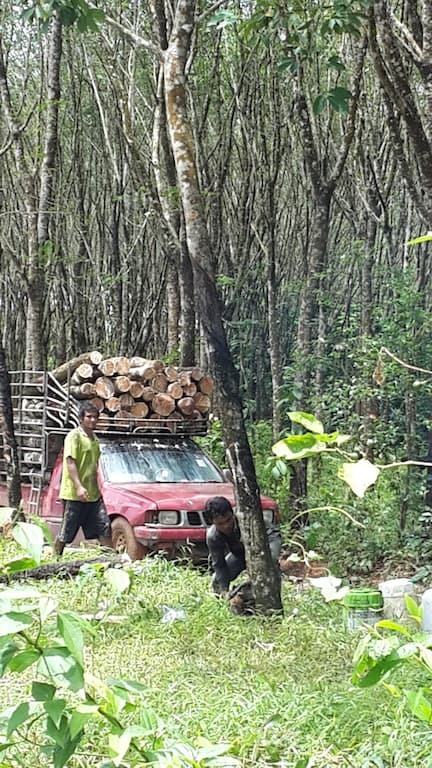 Pineapples have been traditionally grown in the South Western provinces of Thailand but with the sharp decline of natural rubber prices over the last few years (1kg –was 99 baht in November 2012, it’s now 61 Baht in November 2016) many Thai farmers are chopping down their rubber trees and growing pineapples in other areas including Trat province where we reside. 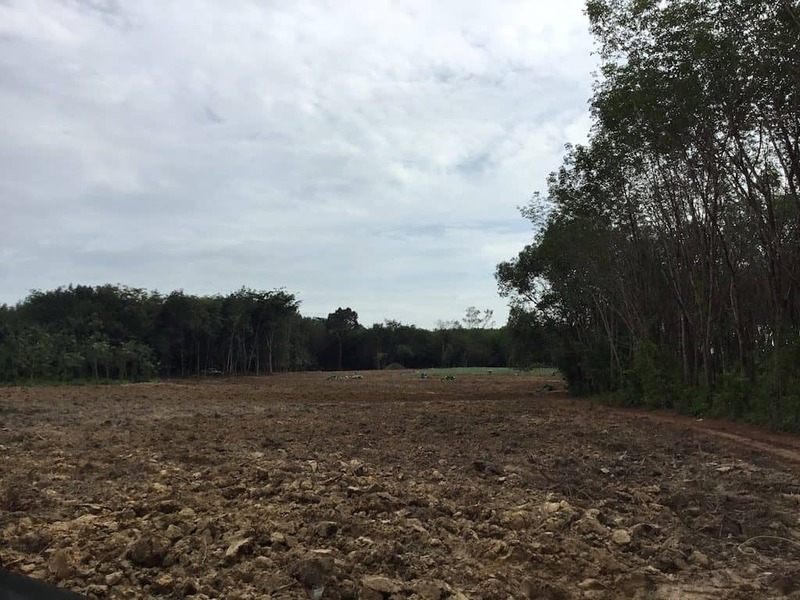 When we purchased our property there was 8 rai of rubber trees directly behind us. It looked very beautiful and was a peaceful place for an afternoon stroll in the shade. A month or so ago the area was leveled as it wasn’t commercially viable to farm rubber anymore. The farmer cut down the trees and sold the lumber and is now planting it out with pineapples, which looks like backbreaking work for the small team of 3 or 4 laborers. 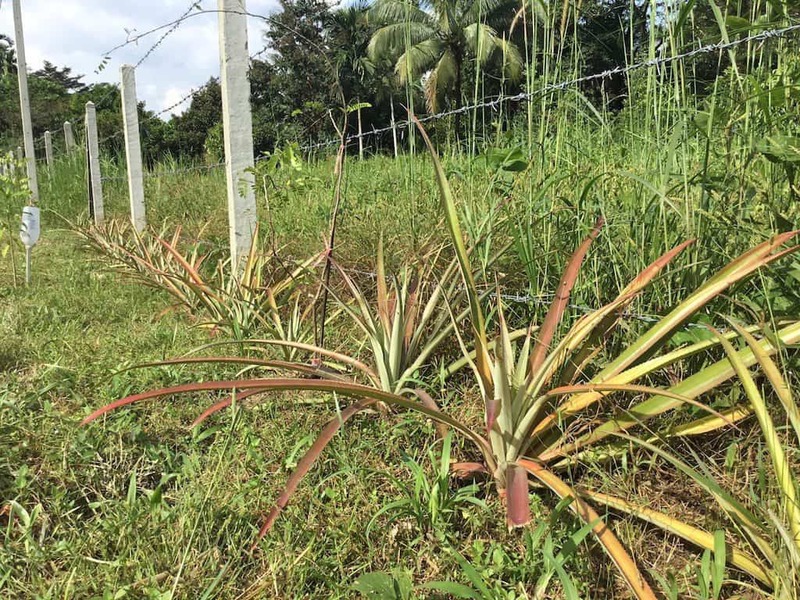 Growing pineapples isn’t hard and can be done just about anywhere. If you are in a cold climate (unlucky!) you can grow them indoors. I’ve grown pineapples I bought at the market from their tops. 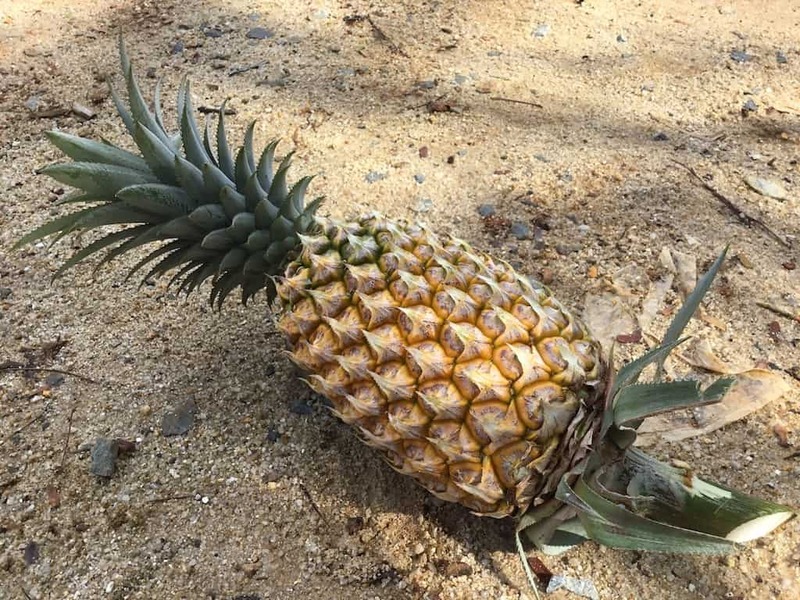 You simply discard the fruit and two thirds of the leaves and pop your pineapple into a pot or directly into the ground. It will take about 2 years to produce its first fruit. 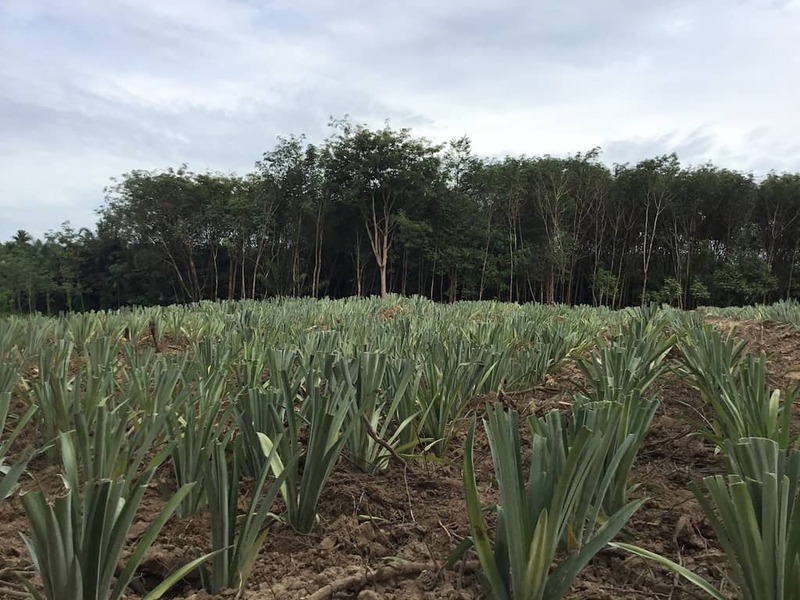 Pineapples have a very shallow root system and take most of their feed through their leaves. They will grow just about anywhere but a bog. They also like lots of sun but will flourish almost as well in semi shade. In Thailand you can buy a small pineapple plant for 2 Baht. Plant it and a year later harvest the fruit. The local farmer tells me he sells each pineapple for 25 Baht. So not a bad profit margin and it certainly beats leaving your money sitting in a bank at next to 0% interest. I bought 55 pineapple plants for 100 Baht and planted them on a border about 30 centimeters apart. 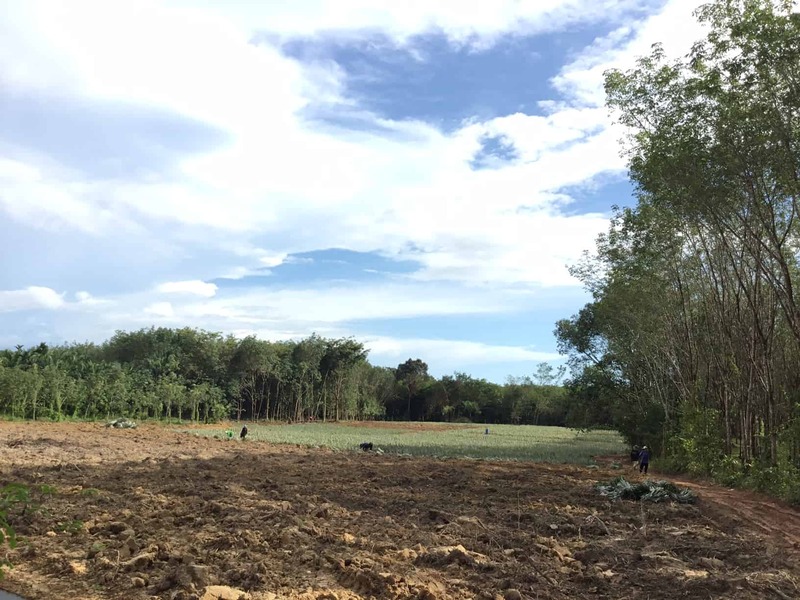 I will plant a few hundred more to create a soi dog proof border that will keep those pesky canines from bothering the chickens. 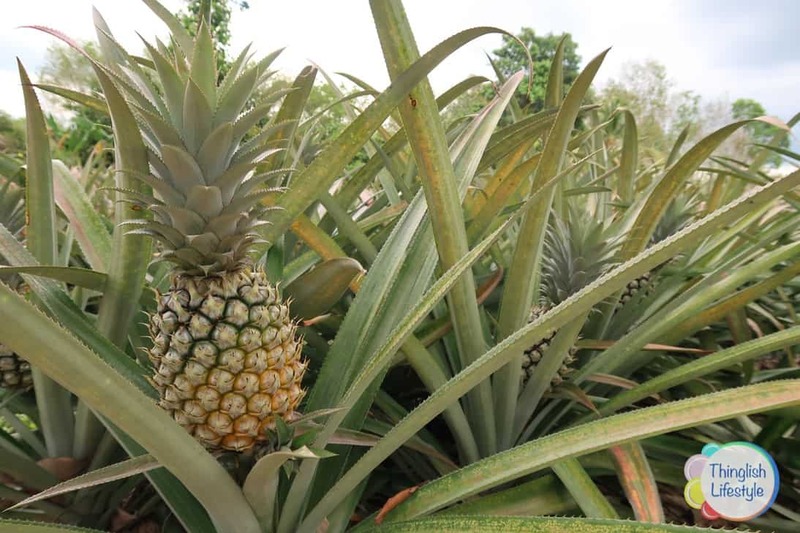 A pineapple plant can grow up to a meter in height and diameter and their leaves are razor sharp so are a great natural way to keep the dogs at bay. One quirky thing I learnt when planting the young plants was to just lift a tuft of turf and tread the plant in at about 45 degree, within a week they upright themselves. Planting 55 pineapple plants didn’t take me to long. In the field behind us they plant from sun up to sun down. They’ve been at it a week now! Ouch! One of the main reasons we grow our own food is that it not only tastes better picked fresh directly from the garden but we can also guarantee it to be pesticide free. I’ve heard commercial growers use three or more carcinogenic pesticides on their crops. We don’t want our food covered in poison thank you very much. 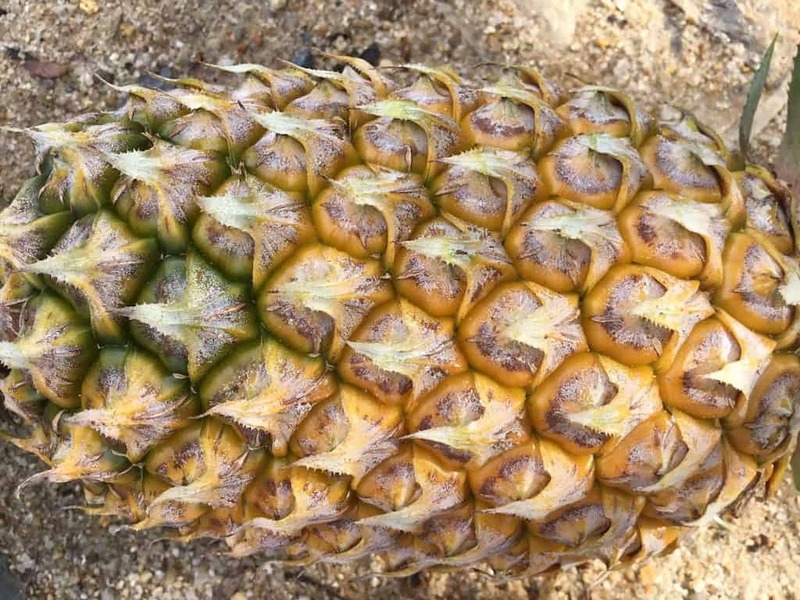 An organic homegrown pineapple is very nutritional and contains high amounts of vitamin C, manganese and fiber. All natural and all good. Perfect for smoothies, desserts and a healthy snack. So if you want a taste of the tropics from a set and forget plant, pineapples are the way to go… or are they? 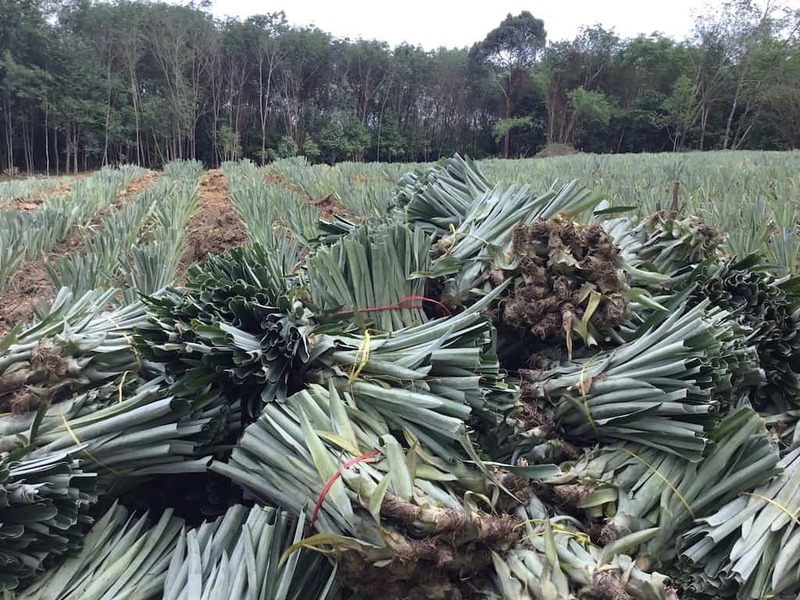 Here’s an update in video of the pineapple crop in mid January 2018, just over a year from the original published date. If you enjoyed this article, please share on Facebook, Pinterest, Instagram or Twitter. Your support is appreciated. 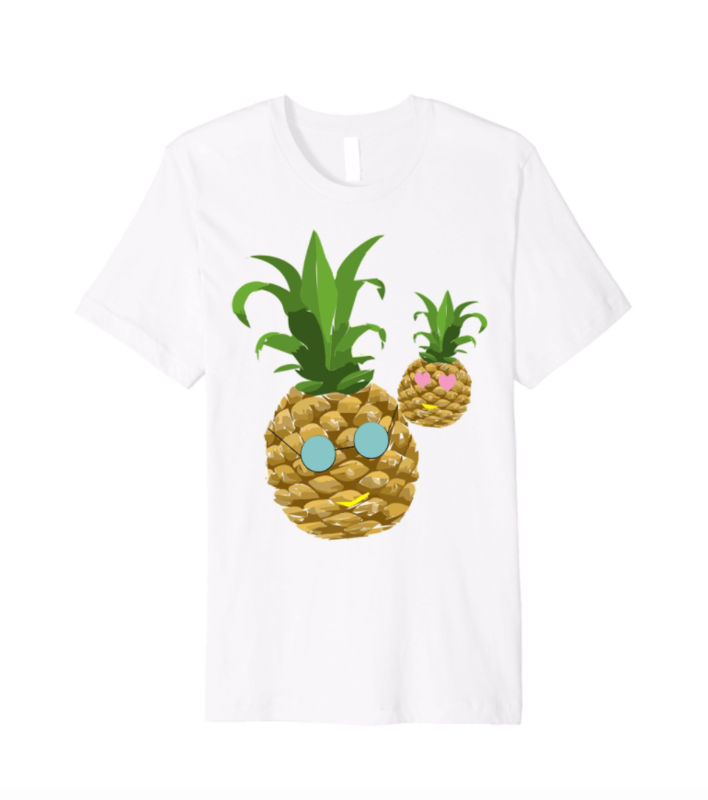 Please visit the Thinglish Lifestyle brand T-shirt shop on Amazon for cool apparel like this pineapple design. Got more to add, leave your comments below. Very much enjoyed your video. 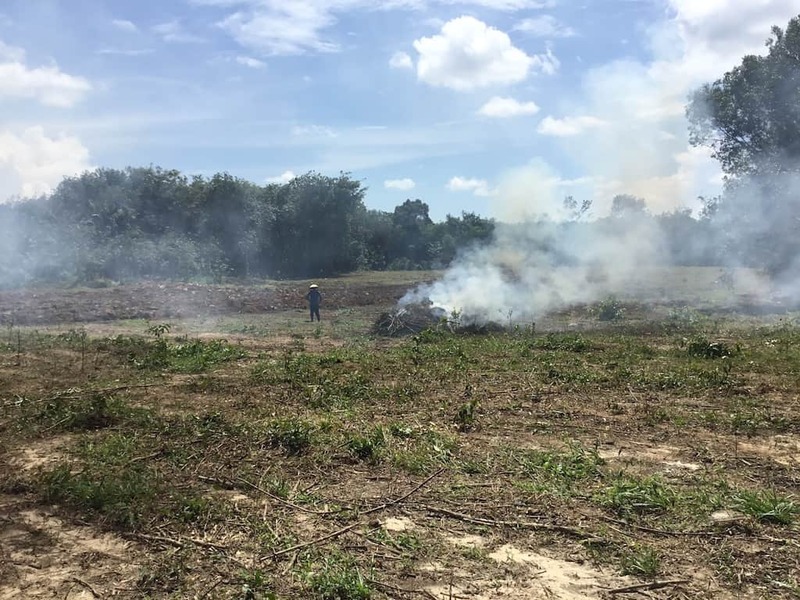 Visiting from Canada I was introduced to permaculture in Yucatan Mexico last winter always enjoy read, hearings do learning more about growing food. 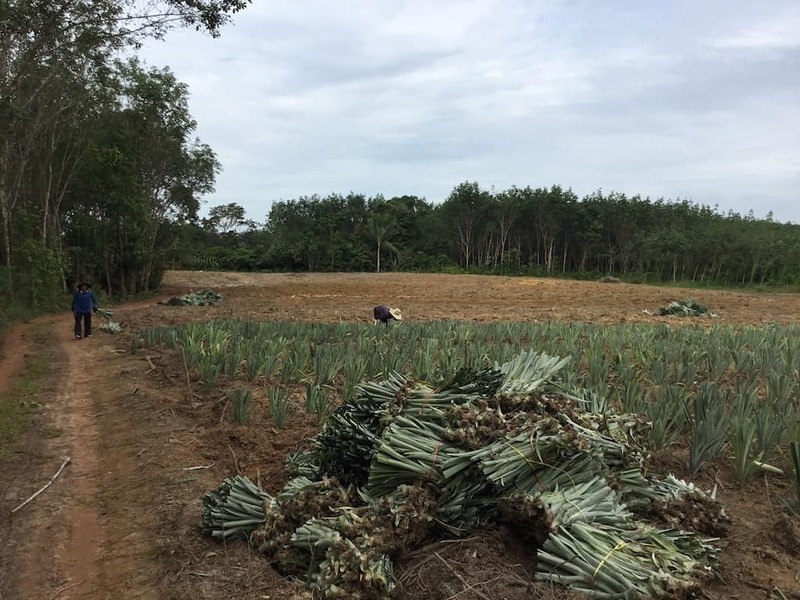 Read this because I am hoping to visit a pineapple or rubber or any type of farm while in Hau Hin then traveling north to Chang Rai. Pleased to hear you enjoyed our Pineapple video. They started to harvest them only yesterday! Enjoy Chaing Rai. There are some wonderful tea plantations and strawberry farms nearby too.